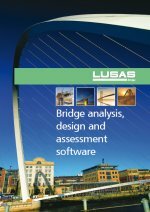 LUSAS Bridge has an easy to use, associative Modeller for modelling / results processing and a fully integrated Solver that can also be used independently. The user interface is a full native Windows implementation providing an Open Interface to ActiveX compliant Windows software such as Excel, Access, Word and other software. Customisation of menus, toolbars and dialogs plus the ability to create your own wizards with Visual Basic Scripting provides limitless potential to tailor the software to specific needs. Models are formed of layers where the visibility and properties of each layer can be controlled and accessed via the layer name held in a Layer treeview, one of a number of treeviews used to organise and access model data. Models are created using feature-based geometry methods (points, lines, surfaces and volumes)and CAD import / export is supported. As the model is built up, model features may be grouped together and manipulated to speed up data preparation or to enable parts of the model to be temporarily hidden. A model merge facility allows design teams to create separate models of specific parts of a structure and then combine them a a later date into one master model. Model attributes such as thickness, material, loading, mesh/element type etc. can be named explicitly. Once defined they appear in an attributes treeview ready to be assigned to selected geometry of the model using the "drag and drop" technique. Automatic meshing with an easy-to-use mesh refinement capability. Built-in associativity, a key feature of the LUSAS Modeller, ensures that if the model geometry is amended, all assigned loadings, supports, assigned mesh and other attributes are automatically updated to suit. Fleshing (the visualisation of assigned thicknesses or section shapes) helps to ensure that the thicknesses and eccentricities of slabs and the orientation of beam members are correctly defined. Datatips reveal useful model information such as assigned properties when the cursor is positioned on top of a geometry feature. The OpenGL implementation provides fast graphical displays. Multiple graphical windows allow simultaneous displays of different parts of the model at different orientations. Powerful cursor selection options and pan, zoom, dynamic rotation and pre-defined views allow for easy viewing and editing of your model. Basic geometry data from third-party BIM/BrIM files (*.ifc) can be imported to create a feature-based geometry model in LUSAS. Both BIM/BrIM Structural domain files (*.ifc) and BIM/BrIM Architectural domain files (*.ifc) are supported for export. Detailed on-line dialog help links to additional reference manual material to provide you with the most appropriate level of assistance at all times. Modelling wizards allow for rapid model generation. A grillage wizard enables the rapid generation of a wide variety of orthogonal, skewed and curved multi-span grillage arrangements. Cracked sections can also be included. A multiple automatic influence wizard permits the definition of all or selected model locations of interest. Loadcase generators for moving vehicle and train loads and the ability to model various dynamic pedestrian loading configurations are available. Section libraries and a range of section property calculators help to provide for straightforward modelling of grid/grillage and beam models. An option for including the contribution from a slab is provided so that the section properties required in a grillage model can be obtained. Section properties for common section shapes such as rectangular, circular, I-shape, T-shape, L-shape, T-Shape and Z-shape sections can be easily calculated. These include: riveted I-section, T-shape, box, trough and cruciform sections, riveted boxes from I sections / channels, I-section with channel, or doubler plates, and welded plate boxes. Section property data for any drawn shape or collection of section shapes can be calculated using an arbitrary section property calculator. For thin box sections, only the points and lines that define the centrelines of the plated members, and the geometric thickness of each line need to be initially defined for section property calculation to take place. Compound sections can be defined from existing library sections. These can be positioned relative to each other and can have differing material properties assigned. This enables section properties of a single or multiple box cross section (with and without voids) to be calculated from user defined dimensional data. The section shapes can be defined either as a simple cross-section or as complex section created from as many lines as are required to form a suitable representation of the true cross-sectional shape. Tapering beams can be easily defined by specifying section properties for each end. 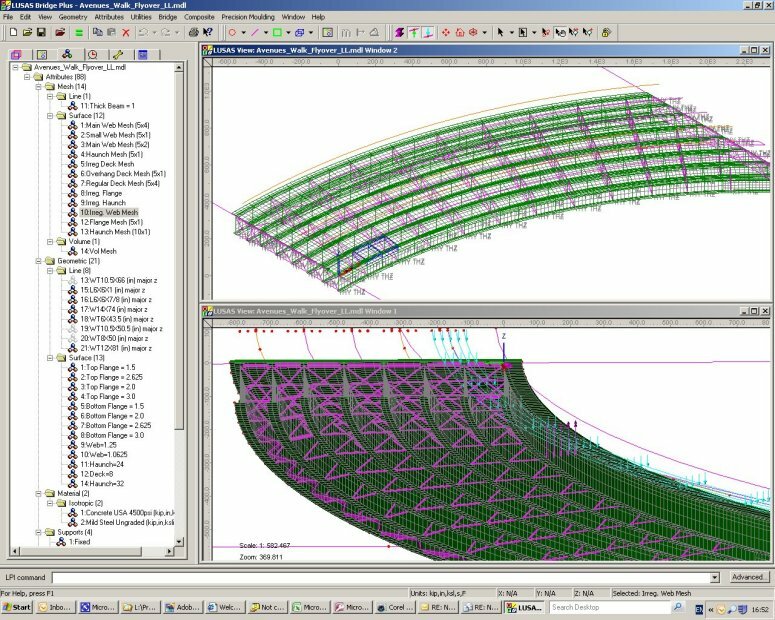 Multiple varying sections can be defined along a path of lines allowing straightforward building of models for bridges having curved soffits or for arch structures having varying cross-sectional thicknesses. Use of the tapering beam and multiple varying section facilities enables simple prototype and detailed staged construction models of bridges formed of tapered box sections to be created in a very straightforward manner. A library browser permits transfer of attribute data, such as mesh, geometric, material, etc., between models.